Essentially a one-man band in the vein of Bathory's mighty Quorthon, Falkenbach, masterminded by the mysterious Vratyas Vakyas (which means 'the searching wanderer'), plays epic heavy metal best described as Viking pagan metal with definite leanings toward folk-driven metal. The sound is majestic, straightforward, and sprinkled throughout with doses of black metal. The CD opens with Heathen Foray, and immediately the Bathory influence comes through, from the epic opening and the droning guitar riff to the vocal approach and the subject matter (if you've heard Blood Fire Death, Hammerheart, or Twilight Of The Gods, then this one will ring true). Of Forests Unknown switches gears, tapping into full-blown black metal, with Vakyas switching to a harsher, raspier voice and the percussive rhythms layered with blast beats. Havamal returns to the epic sound, with soaring clean vocals, acoustic guitar flourishes, and rousing chants. The music fits the subject matter perfectly: Havamal is an epic poem, literally meaning 'the words of the high', spoken by Odin to the Northern people of Europe. Roman Land features a rollicking guitar sound sure to boil the blood. It also ventures into epic metal, complete with spoken word and majestic choruses. Heralder continues in this vein, with the guitar churning out high-pitched, flute-like sounds and subtle keyboards weaving a tapestry of the grandiose. Moreover, the spoken word plays a prominent part, as do some electric violins and other stringed instruments. Such flights of whimsy make this track a true standout. Laeknishendr then returns to a black metal foundation, with the blast beats giving no quarter, the guitars shredding apart anything in their path, and Vakyas' rasp holding court over the proceedings. Suddenly, however, the black metal disperses, leaving in its wake a singular acoustic guitar, which is followed by an epic chorus sure to leave even the most jaded listener breathless. Walkiesjar starts off with some primeval percussion but suffers a little by a guitar riff that reflects much of what has come before. Fortunately, the song's overall structure, and in particular the chanting choruses, save it from obscurity. The closer, Skirnir (Freya's messenger and vassal; his name means 'the shining one'), features some female spoken words and a straight-ahead narrative approach punctuated by moody music. 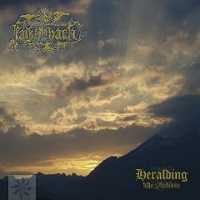 Fans of Viking pagan metal will definitely dig Falkenbach's Heralding - The Fireblade. The band is not as folksy as Skyclad or Korpiklaani, nor is it as intense as Amon Amarth and Enslaved. However, if you like bands such as Bathory and Mithotyn, then this is the CD for you.